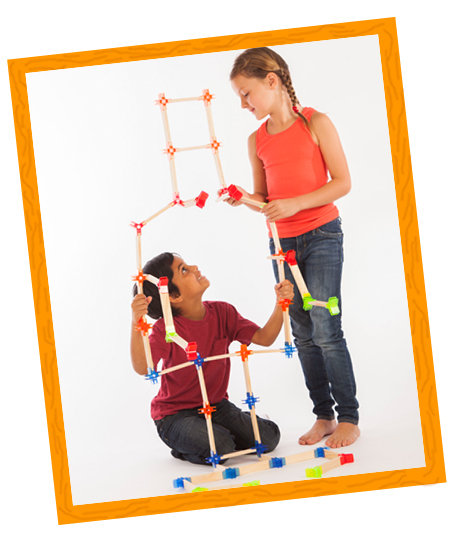 Editor Note: We were introduced to a new early-start learning construction toy system called brackitz and believe a review for our readers is worthwhile because of its applicability to science, technology, engineering, and math (STEM). 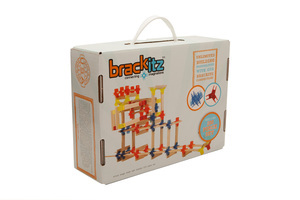 Brackitz is a construction toy system produced in the USA that launched in November 2014 which has won many awards including Brain Toy from Academics Choice, Toy Man eChoice, STEM Toy Award, and Creative Child Toy of the Year. Standard sets include interlocking 4-inch American Maple wooden planks, and 90° and 120° angle connectors, which can be pieced together to form a wide variety of models and architectural structures. Sets are available in 50, 100 and 200 pieces with prices ranging from $29.95 – $99.95. We were told that the brackitz set could be used to construct innumerable creations; the one-of-a-kind connectors can interlock at different angles and directions and allow children to build circles, corners and bendable masterpieces. With the challenge to use brackitz for building strong, durable masterpieces, we tasked our product reviewer Tristan to review the product and report back. His review is below. Brackitz are wood planks connected by plastic connectors. When I first opened the Architect set box, I imagined that I could build a tower with them. But after spreading the planks out, I decided instead to make something human. I imagined the robot needed legs, head hands, knees and pants. It was really challenging because we only had a certain amount of planks and a certain amount of connector pieces and they’re all the same size. So if you wanted to make something uneven, you had to be creative. I thought if my robots could stand up they could look human, so I made them into boxing robots for my friend and me. I liked them because they are able to withstand enough weight to keep them up, and also they are balanced quite well within the hands of a good user. They were easier to use than other plastic building blocks because they stayed together, even when we made the robots box each other. After we finished boxing the robots, we decided to make belts out of the planks. The belts are made with three segments, each with six planks that were easy to use. I made a hexagon in order to form it around my body. My friend did the same thing, using different colored plastic connectors. Then we connected other mini parts to them, and made chest plates. After that, we made battle shields and axes. We decided to try out the weapons and they worked pretty well until my mom made us stop using them inside the house. I felt very well organized with the brackitz because they are the same size and the connector pieces are colored by shape. I liked brackitz a lot because when I grow up I want to be an architect, and building with brackitz is like building buildings. One thing I would fix is the sturdiness of the plastic connector pieces. They held up pretty well during the robot boxing and the axe fight but one of them broke when I accidentally stepped on it. I would recommend this to kids who like to do architecture or kids who like any other type of building toys.